A door is a face—it is the first hint of what lies behind it. Victor Klassen wood doors—the material, the quality of the work, the mastery and artistry—hint at rooms and houses filled with beauty and strength, warmth and whimsy. And sure enough, these monumental creations have formed and transformed the aesthetic of many a home. The artist culled inspirations from geometry, the natural world and the human form, and wielded them to elevate the quotidian door to the status of breathtaking art. 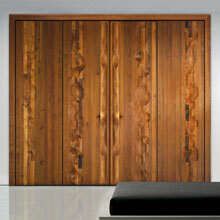 These wooden doors are custom made; each one is like no other. 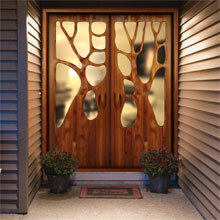 We also can work with you and your specifications to build the door that you envision for your home.